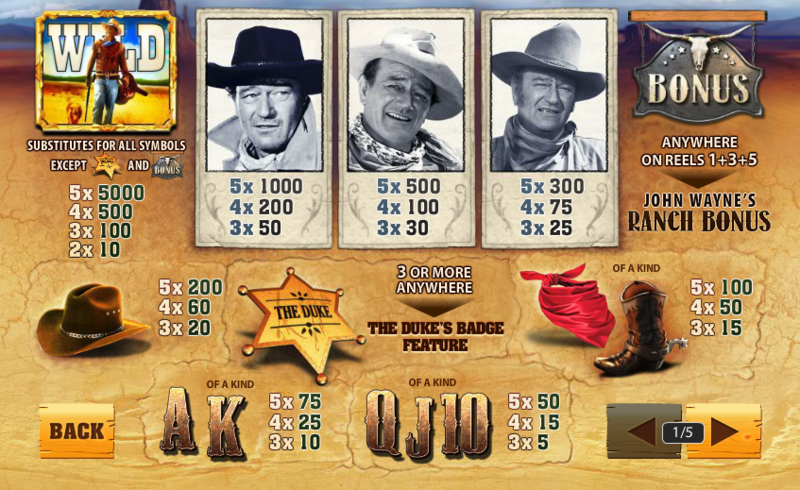 An online slot machine based on John Wayne is surely something that will be popular with most slots fans, especially those who remember The Duke and his numerous films. He died in 1979 but his name and reputation live on in almost 150 movies, mostly Westerns but other genres as well. We can easily gloss over the fact that his real name was Marion Morrison and take a good look at this slot. It’s a five reel and twenty five payline slot from Playtech and it’s distinctly cowboy-based with a plethora of Western-themed items. The low value symbols are Playtech’s standard playing cards but the higher value ones are a spurred boot, a scarf, a sheriff’s badge (which actually says The Duke) and a cowboy hat. There are three separate real life portraits of the man himself, a wild card featuring The Duke and his dog and a bonus scatter symbol which is a cow’s skull on a metal sign. The way to trigger this minor feature is to land three or more of the shiny Duke’s Badges anywhere on the reels in normal gameplay; you will then get to pick one of the badges which will reveal a cash prize. The amount of the prize will depend on how many badges you landed and the size of your stake. This is the real money-maker (or at least it was for us); you need to land the bonus cow skull sign on reels one, three and five and to start with you’ll be given three fee spins with a 1x multiplier. You will also receive a number of bullets which you use to shoot tin cans to reveal prizes such as more free games, multipliers, more bullets, extra wilds and extra scatters. All those extras are added to your bonus spins and the free spins will now begin; it’s also possible to trigger more free spins within the bonus game by landing the appropriate ‘More Free Spins’ symbol on the middle reel. 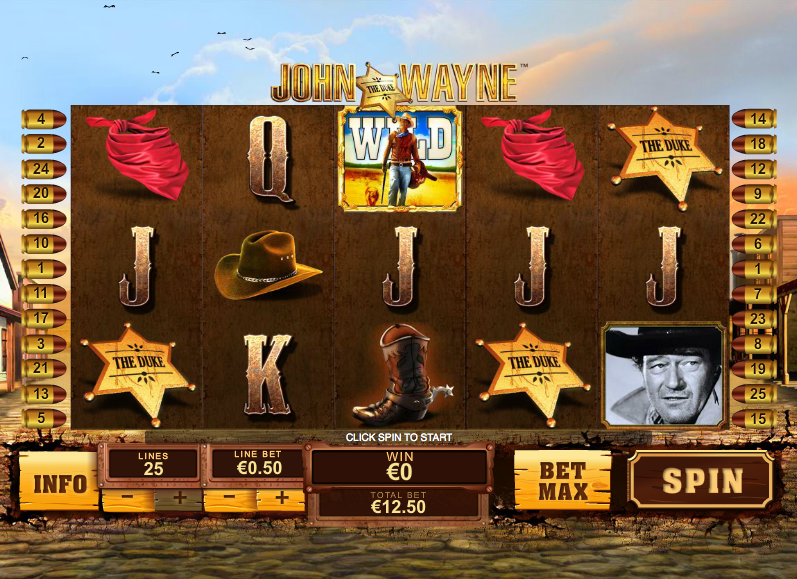 There’s nothing not to like about a slot machine based on John Wayne even if you were never a fan of his movies; there’s a huge betting range from €0.20 for one payline all the way up to an astonishing €12,500 with everything maxed out.